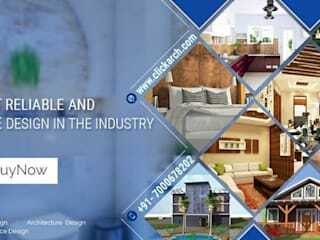 At Click Arch, we bring you the best of Team to give you an array of designs for your dream projects. All you have to do is just tell us the landscape area for your project and pick a design to customize. Our team of experienced Architects would not only give you the perfect solutions but also make sure that in an affordable and effective budget you get a world class design. Our design kit has solutions for every project. From Floor plans, 3D Elevation, Interior designs, Technical drawing to even expertise on Architecture, we offer a wide variety options. All of the designs are well drafted to adhere to the Norms of Municipal Corporation.Basic idea behind this initiative was to provide high-end yet affordable designs rather than burning under high & traditional cost. Through the launch of Click Arch, anyone can have their dream designs by placing the order online with us and we will design the layouts according to the requirements and sizes. The best part is that the designing will only take 4-7 days.